Our fully qualified driving instructors offer affordable and knowledgeable driving lessons in High Wycombe – if you’re looking for a company that will have you driving confidently from Downley all the way down to Loudwater, then we are the school for you! Your driveJohnson’s instructor will most likely get your lessons started on a road like Garratts Way to practise things such as moving off and stopping, changing from 1st to 2nd gear as it’s a wider and quieter road. Our instructor will help you cover everything you need to know; ready to help you book your driving test for High Wycombe Test Centre in Cressex Business Park. Your examiner will test you with at least one manoeuvre and ask you to do some independent driving, one of the popular routes is getting you to go to the Booker area, where you will asked to follow signs to the M40. Fortunately for you, all of our instructors are familiar with the independent driving routes so whatever the examiner throws at you, you should be confident and have some prior experience to deal with the roads ahead. Pupils who have recently passed with us in High Wycombe. 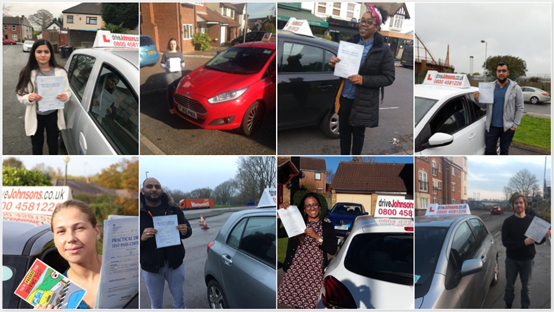 Our driving school in High Wycombe aims to pass all of our learners as quickly and safely as possible, whilst maintaining our incredible pass rate of 89%. We have managed to protect such a high pass rate by hand picking Grade A instructors, that are punctual and communicate well with their pupils. They offer flexibility on lesson times, and always plan structured & enjoyable lessons for you! Before you know it, you’ll be conquering the busy A404 and shifting between 30mph roads and 60mph roads like a pro. Try your first lesson with driveJohnson’s today for just £20 and see why we are chosen by so many. How much do driving lessons cost in High Wycombe? Baldev was my instructor for the last few months. I can't thank him enough and praise his teaching methods. He was patient, calm and a font of knowledge. His guidance helped me get rid of anxiety behind the wheel and I am forever grateful. I was a lapsed learner and the previous instructor has put me off learning to drive,while Baldev has been very understanding and supportive of this mum of two under fives and I passed my test. Good luck Baldev and thank you.